Easy and delicious! Walnuts, extra virgin olive oil, water, brown sugar and baking soda, cooked till caramelized and cooled till crispy! Great for topping salads or side dishes! 2 T. light brown sugar, plus an additional 2 T.
Place walnuts, olive oil, water, baking soda and 2 T. of the brown sugar in small saucepan. Cook on medium-low heat, stirring continuously till smooth and it foams up and boils. Continue cooking and stirring about 1-2 minutes till foam disappears and some water evaporates. Add the additional 2 T. brown sugar, stirring to coat evenly and till mixture gums up, but where some sugar remains grainy, but brown. Immediately transfer to plate in even layer. Refrigerate till cool, about 15 minutes. 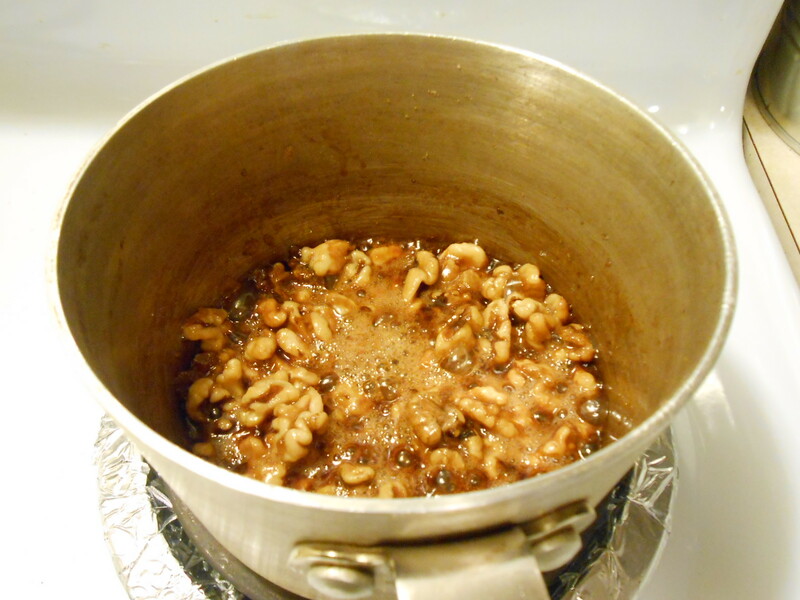 After 15 minutes, stir on plate to separate walnuts, then return to refrigerator till ready to use. When ready to use, remove from refrigerator, separate clumps again, and let set at room temperature a few minutes before using. Check Out Miyoko Green Beans to see how I used them in a side dish!